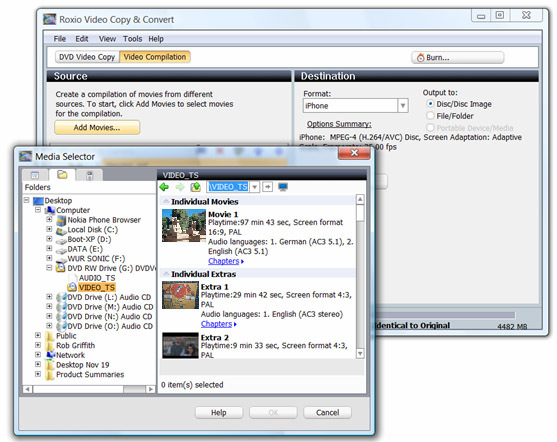 Roxio Easy DVD Copy 4 Premier is fast and easy software for making backup copies of DVD-Videos, copying DVDs to portable players, and for converting movies to DVD-Video. Copy DVDs to disc, iPhone, iPod, PSP and other portable devices. Convert video files to DVDs. Windows Vista certified and optimized for XP. Burn confidently with Easy DVD Copy 4, using advanced burning features and flexible tools. Easy DVD Copy 4 is compatible with virtually all DVD drives. Make your media as mobile as you are. Show off your videos on iPod®, PSP®, or your cell phone. Compile movies to DVD. Copy TiVo®* programs to DVD. Compile movies from different sources and burn to DVD. And create attractive disc labels. Convert, compile and copy to DVD - supporting a wide range of formats. Easy DVD Copy 4 enables you to enjoy your media regardless of format or device.